Today's society is far more mobile than it was in previous generations. It's no longer the norm for families to remain in the same home throughout the lifetimes of their children. Some causes are positive, such as job changes or promotions, while sadly others may be necessary but unpleasant. Kids are usually resilient by nature, so the effects of such moves on them are sometimes overlooked. Most of them will bounce back, but the transition goes much more smoothly if they have your support. If you and your family are facing relocation, use these tips and suggestions for specific ways you can help your children adapt successfully. Share the news with your kids early enough that they have time to come to terms with it at their own pace. Be careful not to do it so far in advance that their imagination has a chance to conjure up additional fear and uncertainty. Emphasize things that will remain the same, such as bringing along favorite possessions or a beloved pet, so they have a sense of continuity. Parents themselves sometimes don't share the same feelings about the move. One may look forward to the change while the other is reluctant to uproot the family. Regardless of your emotions, it's important to present a united front to your children. They have enough to handle without sensing the tension between you and your spouse. Allow your kids time to "grieve." Connections to family, friends and familiar locations are painful to break. Experts estimate that it takes children at least six months to fully adjust to the change, so don't become impatient if they suffer periods of the blues. On the other hand, you don't want to indulge their emotions to the point of total meltdown. Model coping skills by showing them how you manage your feelings of sadness and loss in a constructive manner. Allowing them to be involved in appropriate decisions, such as items for their new bedroom, channels their emotions in a positive direction. Take your kids around to meet the new neighbors. The sooner faces become familiar, the sooner they will feel at home. Check with the new school to see if they will assign a buddy to show your child around the building while introducing him to other kids. 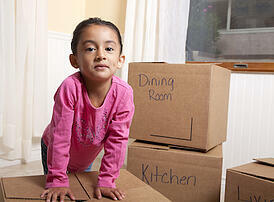 If at all possible, schedule your move during summer vacation to minimize disruption that could hinder the adjustment. Residents of our Springs Apartment homes come from a number of different cities and backgrounds, giving our communities a fascinating diversity. What path led you and your family to your current home?